Formula One Grand Prix returns to U.S.
(CNN) -- Formula One is set for a return to the United States in 2012, after an agreement was reached to build a brand-new racing track in the Texan state capital Austin. The decision for the southern American city to host F1 on a ten-year deal was confirmed on Wednesday, by the sport's rights owner Bernie Ecclestone. "For the first time in the history of Formula One in the United States, a world-class facility will be purpose-built to host the event," he told the official F1 Web site. "This will be the first time a facility is constructed from the ground up specifically for Formula One in the US." Is America interested in Formula One? 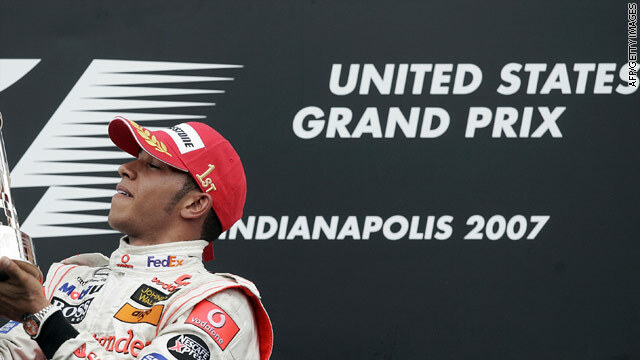 The U.S. Grand Prix was last held at the famous Indianapolis Motor Speedway in 2007 and America has hosted F1 Grand Prix's in a number of locations across the country since the 1950's. However, the U.S.'s relationship with the sport ended amidst controversy when a dispute between tire manufacturers in 2005 led to most drivers boycotting the race and only six competing. But speculation has been rife over F1 returning to the country for some time, after Ecclestone made no secret that he wished to make a fresh attempt to crack the U.S. market. New York, San Francisco and Miami were some of the other locations in the frame to host a revamped U.S. Grand Prix, but it was the surprise contender Austin that won the race in the end. And organizers in Austin are confident that after its five-year break F1 can become more popular in the U.S. that it was last time around. "We realize that over the last 30 years there have been one or two missing pieces from the previous editions of the United States Grand Prix," Tavo Hellmand, managing director of US Grand Prix promoters Full Throttle Productions told the F1 Web site. "We have a tremendous opportunity at hand to do it right - to feature Austin as the backdrop and produce one of the great sporting events in the world." The American company Goodyear is also competing to provide the tires for the next F1 season -- along with Italian tire firm Pirelli and French firm Michelin -- which could further increase American influence in the sport. There is also the prospect of the all-American team USF1 taking part in future F1 racing -- the team failed to line up on the grid for the 2010 Championships due to financial troubles, but the sport's governing body, the Federation Internationale d' Automobile, are considering the possibility of the team taking part in the 2011 season.